In part 1 of our three part comparison of top green powders we examined Ormus Greens by Sunwarrior. 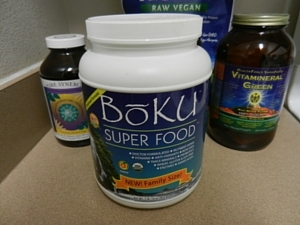 Today we take an in-depth look at Boku Superfood. The best price we have seen can be found here, which sells the Superfood for 20% less than at Boku’s website with no monthly auto ship. This is a high end super green powder that incorporates some typical ingredients along with medical mushrooms and other powerhouse ingredients. For those times when we can’t get some needed nutrition or any day, this is a highly recommended and proven product. Boku superfood was originally formulated in 2007 and has undergone a couple reformulations. When added to water for a green drink or added to any juice or smoothie, this will add a tremendous nutrient profile to anything. It is a combination of land vegetables, sea vegetables, mushrooms, superfoods, enzymes and probiotics. And while a high end product, it has a slightly better price point than some similar high end products. This is the number one powder we use at our home. Boku also has other products including the top rated Boku Super Food Bar. It is in a class of its own, packed full of nutrition. It also tastes like a fudge brownie. The company also has their famous Super Protein based on the proteins of organic whole grain brown rice, organic cranberry protein and organic Red Dulse. It is one of the top protein powders anywhere. Helps respiratory, blood and kidneys. It has significant amounts of calcium and helps balance out a lot of the body’s functions. This is a great source of soluble fiber, helping to balance blood sugars and cholesterol. Nopal cactus is on the more expansive side of ingredients and including it shows a commitment to a potent product. So much has been written on these veggies. These are powerful in cleansing the body, providing significant amounts of vitamins and broccoli, Kale and cabbage, members of the cruciferous family of veggies help in the fight against cancer and similar diseases. Parsley contains a lot of its own vitamins and minerals, but one of its main actions is providing healthy dose of Vitamin K, promoting bone health. Parsley also helps to detoxify the liver. We enjoy adding parsley to our green smoothies at our home. Now Boku Superfood’s ingredients get very interesting. Spirulina is a blue green algae that contains the most protein per gram – more than any other known food. Powerful non-animal based protein. It helps support the immune system with its good amount of GLA (gamma- linolenic acid). It also supplies large amounts of Vitamin B-12 and beta-carotene. Organic Chlorella is loaded with chlorophyll, contains 50% protein and copious amounts of flavanoids, carotenoids, lutein, vitamins and other nutrients. It is also a great chelator, helping to remove heavy metals, especially mercury, from the body. Chlorella is also in my top 25 foods list. Kelp, more than any other sea vegetable is loaded with Iodine which is lacking in almost any foods consumed in North America. Kelp (or sea veggies as a whole) are part of my top 25 foods as well. You are probably getting a good idea why Boku Superfood is a prized food at our home – and we haven’t gotten to my favorite ingredients yet). Maca helps the body adapt to stress and increases enducrance and stamina. It is known as a super adaptor. Amino acids, sterols, viatmins and minerals including selenium are some of the many nutirents provided by Maca. Now we get to my favorite ingredients – the medical mushrooms. The mushrooms included are Reishi (wow), Cordyceps, Maikake, Chaga (one of the more recently discovered powerhouse mushrooms), Mesima, Lion’s Mane (brain support), Shitkae, Turkey Tail, Blazei, True Tinder Polypore, Poria, Agarikon and Suehirotake. Agarikon is rarely found in mushroom formulations being more expensive than most but it is powerful. It is this addition of mushrooms that moved the Boku Superfood to the top of my green powders. The formula includes lot of sprouts of many plants including cauliflower, kale, cabbage, pumpkin and broccoli. Sprouts contain up to 50x as much nutrients per gram as the mature plants. 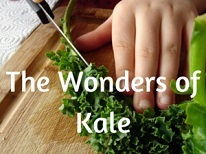 They are loaded with chlorophyll and digestive helping enzymes. Mesquite for its taste and minerals and the amino acid lysine that promotes immunity. Organic Vanilla Bean for its B Vitamins and body balancing properties. Lucuma, called the Gold of the Incas, provides low glycemic carbohydrates, flavor and minerals. The next group of ingredients are fruits. Gojis are one of the top superfoods, packed full of nutrition. Longevity, blood pressure and cholesterol stabilization and other benefits are attributed to the goji. I can attest to one thing- fresh gojis do not taste at all like the fried that you can purchase at stores. Dried taste so much better. We grow a couple goji bushes at our home indoors. They do not produce as many gojis as if they were outside but we enjoy them in the house. When they flower, the flowers range from pink to purple to very light, almost white. Know as heart tonic, these berries help the body utilize oxygen. Three of the best berries, providing anthocyanins and other powerful antioxidants. Also full of vitamins and nutrients to help with sleep and relive joint pain. With its abundant ellagic acid, raspberries help defend against cell damage. 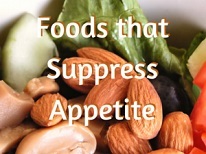 But they also possess other flavanoids including quercetin, kaempferl and anthocyanins. Raspberries are powerful members of the berry group of fruits. Maple syrup is added as a flavoring but also due to its mineral content and the newly identified Quebecol, an interesting health promoting compound. The ingredient list is rounded out with lactobacillus probiotics, sea salt and Digestive Enzymes. Perhaps the power of Boku Sueprfood is summarized best by the Hippocrates Health Institute whose opinion of it was that you obtain more nutrition in one tablespoon of this powder than the normal person obtains in a week from their diet. It is hopefully very obvious what this high end green superfood powder is included in our list of the top superfoods green powders. It is my personal favorite and is consumed in my home.